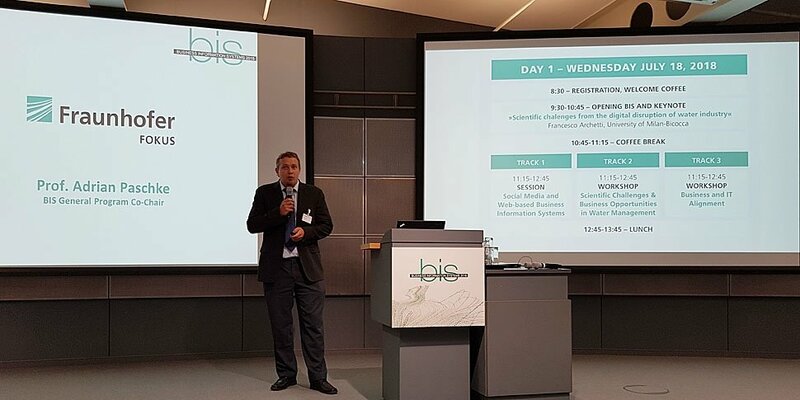 From June 18 to 20, 2018, Fraunhofer FOKUS hosted the 21st International Conference on Business Information Systems (BIS 2018). The annual conference focuses on trends in the development, implementation, and application of business information systems. This year, the approximately 130 participants discussed the effects of digitalization on such systems. BIS 2018 was organized by Fraunhofer FOKUS and the Poznan University of Economics and Business. Over the past 21 years, it has become a meeting place for experts in the development of software-driven business applications. This year's conference opened with keynotes on the topics “Scientific challenges from the digital disruption of water industry”, “Deconstructing Blockchains: Concepts, Applications, and Systems” and “Big Data Management and Apache Flink”. The keynote speakers emphasized the importance of digital disruption, which not only affects individual, data-driven business information systems but entire application domains such as water management or the financial industry. In addition to the main track of the conference, eight other workshops dealt with topics such as “Applications of Knowledge Based Technologies in Business”, “Challenges and Business Oportunities in Water Management”, “Blockchain and Smart Contract Technologies” or “Big Data and Business Analytics Ecosystems”. During the poster session and the guided tour through the IoT Lab, the participants learned more about the research projects at Fraunhofer FOKUS. The conference papers will be published as Springer Lecture Notes in Business Infomation Processing - vol. 320.